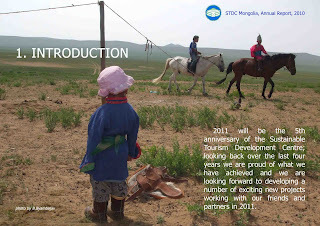 2011 will be the 5th anniversary of the Sustainable Tourism Development Centre; looking back over the last four years we are proud of what we have achieved and we are looking forward to developing a number of exciting new projects working with our friends and partners in 2011. · Journal. 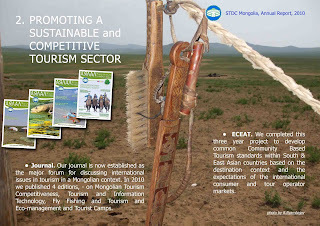 Our journal is now established as the major forum for discussing international issues in tourism in a Mongolian context. In 2010 we published 4 editions, - on Mongolian Tourism Competitiveness, Tourism and Information Technology, Fly Fishing and Tourism and Eco-management and Tourist Camps. 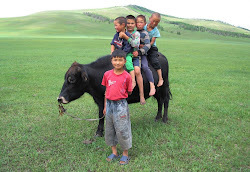 · ECEAT. 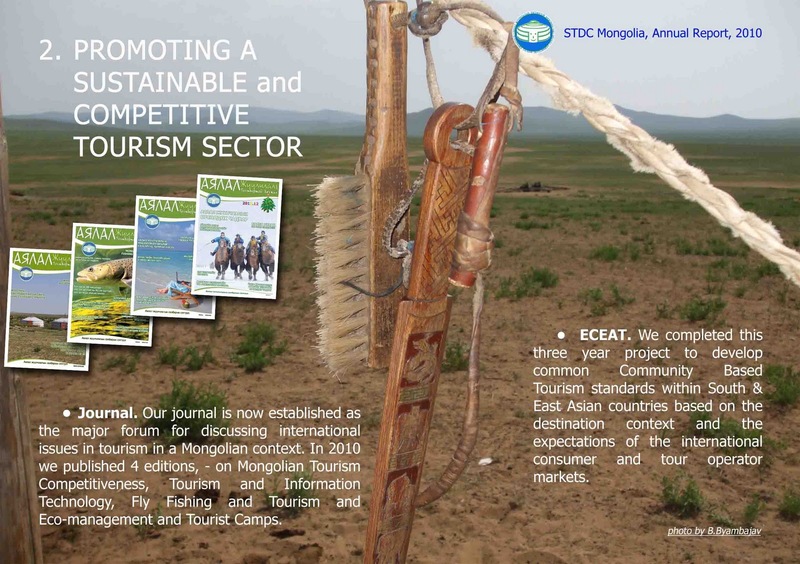 We completed this three year project to develop common Community Based Tourism standards within South & East Asian countries based on the destination context and the expectations of the international consumer and tour operator markets. 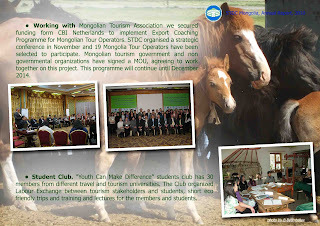 · Working with Mongolian Tourism Association we secured funding form CBI Netherlands to implement Export Coaching Programme for Mongolian Tour Operators. 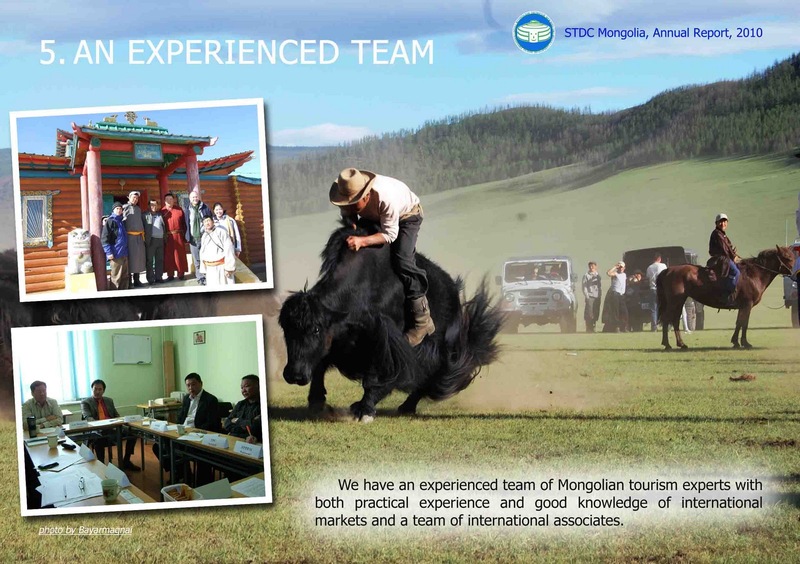 STDC organised a strategic conference in November and 19 Mongolia Tour Operators have been selected to participate. 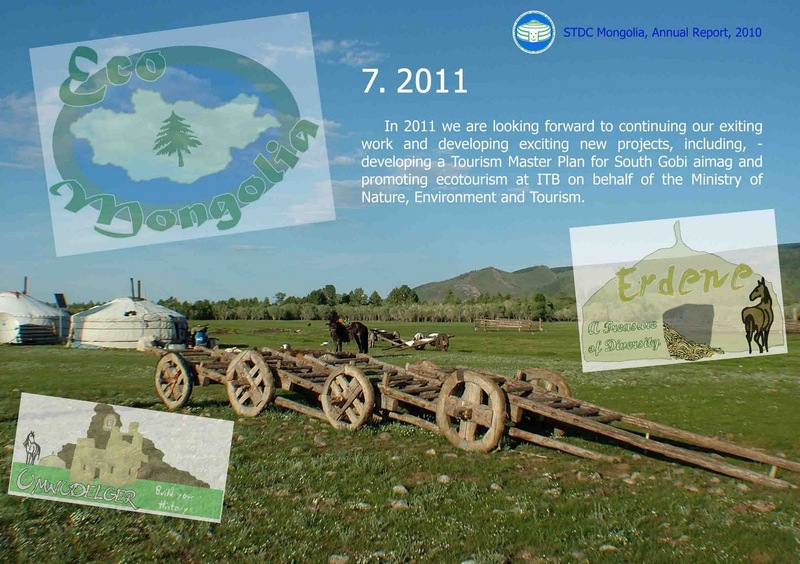 Mongolian tourism government and nongovernmental organizations have signed a MOU, agreeing to work together on this project. 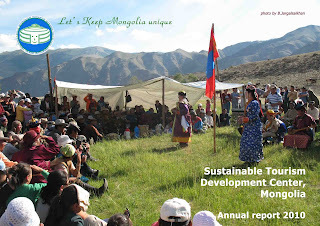 This programme will continue until December 2014. · Student Club. 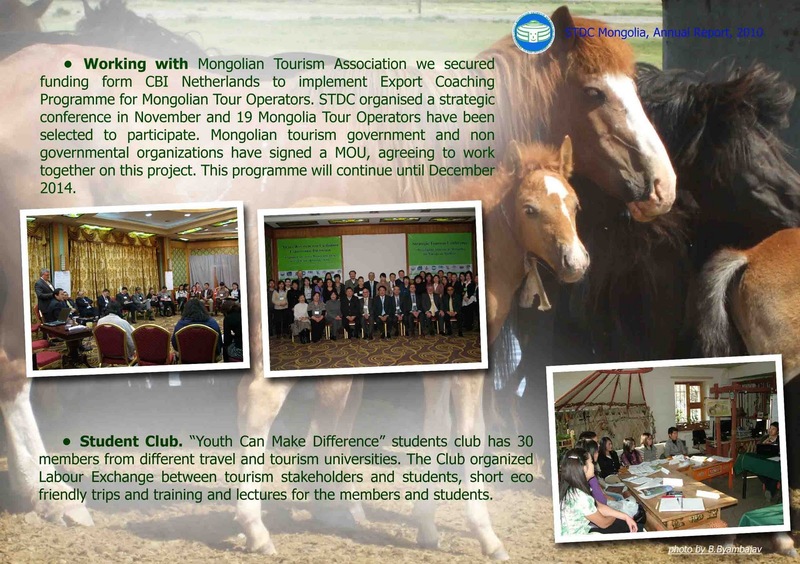 “Youth Can Make Difference” students club has 30 members from different travel and tourism universities. 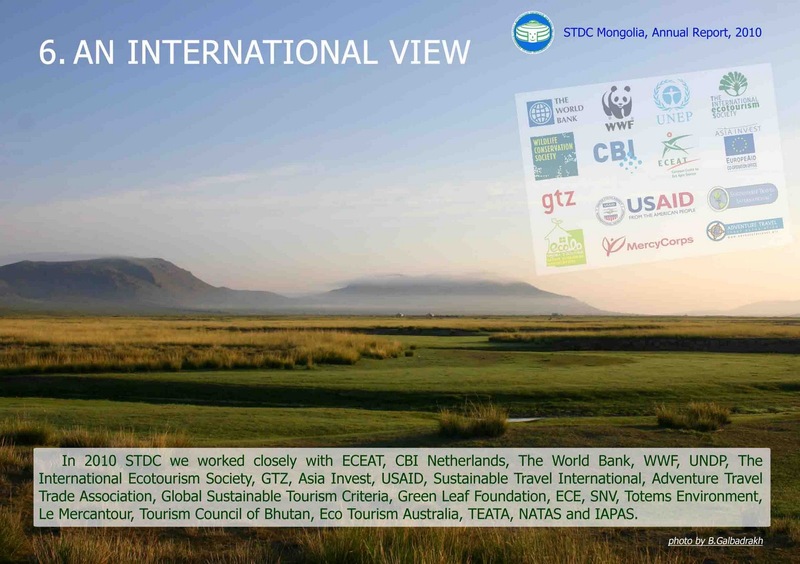 The Club organized Labour Exchange between tourism stakeholders and students, short eco friendly trips and training and lectures for the members and students. · Helped rural 25 rural communities in Gobi Altai, Ovorkhangai and Hovd aimags communities benefit from tourism through technical advice and assistance. 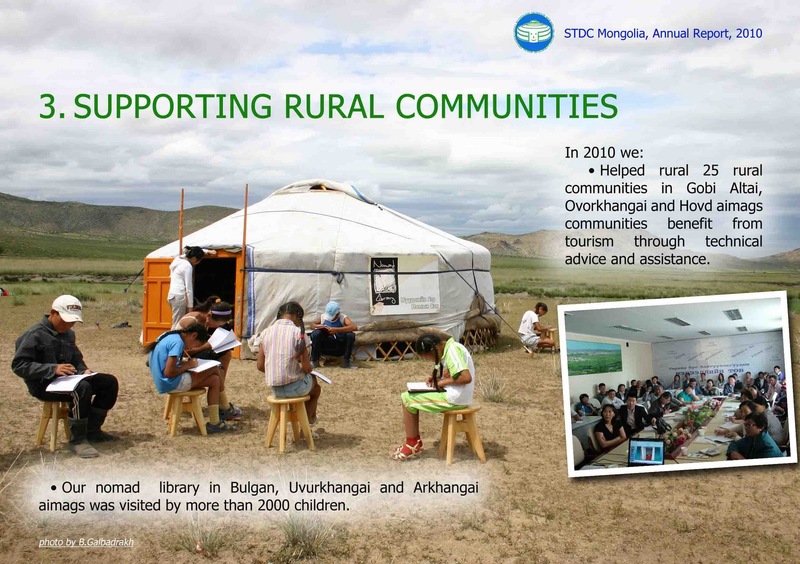 · Our nomad library in Bulgan, Uvurkhangai and Arkhangai aimags was visited by more than 2000 children. 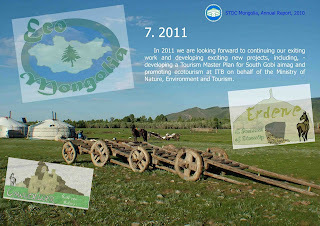 · We developed management plan for Choiriin Bogd Protected Area in Gobisumber aimag. 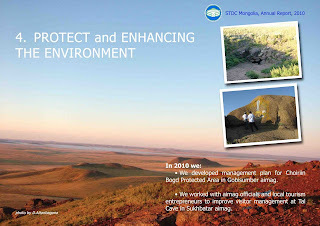 · We worked with aimag officials and local tourism entrepreneurs to improve visitor management at Tal Cave in Sukhbatar aimag. 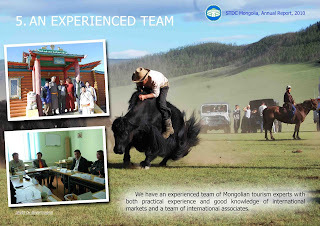 We have an experienced team of Mongolian tourism experts with both practical experience and good knowledge of international markets and a team of international associates. 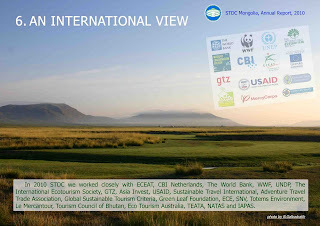 In 2010 STDC we worked closely with ECEAT, CBI Netherlands, The World Bank, WWF, UNDP, The International Ecotourism Society, GTZ, Asia Invest, USAID, Sustainable Travel International, Adventure Travel Trade Association, Global Sustainable Tourism Criteria, Green Leaf Foundation, ECE, SNV, Totems Environment, Le Mercantour, Tourism Council of Bhutan, Eco Tourism Australia, TEATA, NATAS and IAPAS. 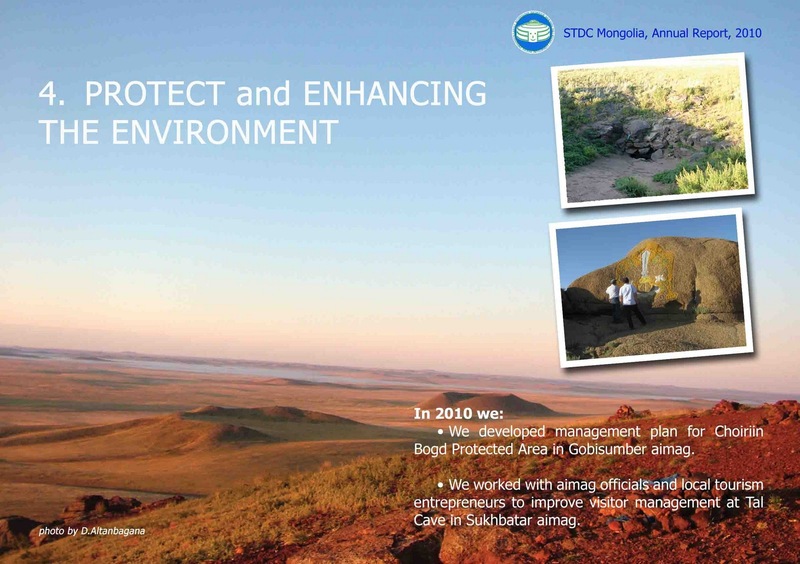 In 2011 we are looking forward to continuing our exiting work and developing exciting new projects, including, - developing a Tourism Master Plan for South Gobi aimag and promoting ecotourism at ITB on behalf of the Ministry of Nature, Environment and Tourism. 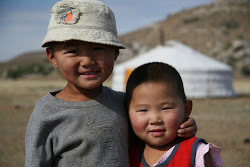 We are pleased to have received financial support from Mercy Corps Mongolia, CBI Netherlands, ECEAT, Istituto Oikos Italia and Administration of Ulaanbaatar city.